Gregg McPherson describes himself as “a recovering Left Brainer who wants to explore much more of my Right Brain.” With a background that includes aerospace engineering, research and development, documentary filmmaking and website management, Gregg McPherson is a new age Renaissance man who has brought a rich and diverse set of interests and skills to his volunteer roles at OLLI. A Michigan native, Gregg received his undergrad degree in Aerospace Engineering from the University of Michigan in 1969, and went on to work for the Apollo moon program, developing scientific experiments to be conducted on the moon. After completing his Ph.D. in Bioengineering at Michigan in 1978, he was hired by 3M and moved to Minnesota. During his 30-year career with 3M, Gregg took on increasingly challenging roles, ultimately managing research and development labs in a number of divisions. His work at 3M also provided the opportunity for him to explore a growing interest in documentary filmmaking—using the company’s video production facilities to create a series of corporate informational videos. After retiring from 3M, Gregg and his wife Carol moved from Minnesota to Hillsborough in 2010. As a way to meet new people and learn the area, they joined the Greater Chapel Hill Newcomers Club and became active volunteers. During his tenure as club President, Gregg’s accomplishments included incorporating the organization, and thoroughly modernizing the club website. After relocating to North Carolina, Gregg started pursuing his interest in documentary production in earnest. He attended an intensive 5-day documentary filmmaking workshop in San Francisco and has also taken numerous courses at the Duke Center for Documentary Studies. Gregg joined OLLI in 2011, gravitating toward courses in history and political science; and he also began volunteering for OLLI, utilizing his filmmaking skills to produce a series of instructor videos. In Spring 2012, Gregg extended his volunteer service as an instructor, teaching an OLLI course on the history of America’s world’s fairs. This subject arose from his interest in the history of technology (world’s fairs originated as technology fairs), which also spawned his often-fascinating blog, Technology Almanac: Musings on the History of Technology and Innovation Past and Present. Meanwhile, Gregg’s filmmaking avocation reached a new level with the creation of his feature documentary, A Knock at the Door: A Documentary Film of the Holocaust in France in WW II, which tells the story of a young Jewish mother and her infant who must escape Paris in the summer of 1942 to avoid the Nazi roundups and deportations to Auschwitz. That infant was OLLI member Paulette Terwilliger who Gregg and Carol met through the Greater Chapel Hill Newcomers Club. This compelling documentary was screened at the recent OLLI Spring Retreat as a featured program. Gregg has also just completed his second feature documentary, Jack, which tells the story of a soldier in the famed 10th Mountain Division during World War II. At the April 1 OLLI Annual Meeting, Gregg was elected President of the Board of Advisors—but that is only his most recently assumed role. 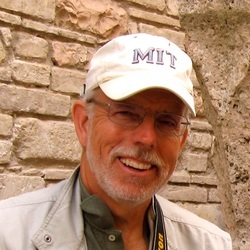 During his tenure at OLLI—and consistent with his broad skillset, Gregg has served in a number of different capacities, including Board Member At Large, Chair of the Board Development Committee, Instructor, Video Producer, and Webmaster—he is responsible for the redesigned OLLI member website, which has elicited much positive feedback from OLLI members. He also currently serves as Interim Chair of the OLLI Communications Committee. Gregg’s priorities as President will focus on three key areas: Building our sense of community, gathering a richer sense of the members needs, and promoting and enriching the volunteer experience. He will also explore new opportunities (e.g., dynamic partnering with other organizations to enhance OLLI activities and curriculum) for OLLI to better serve its members. As Gregg continues to challenge his Right and Left Brains, OLLI is the clear beneficiary.